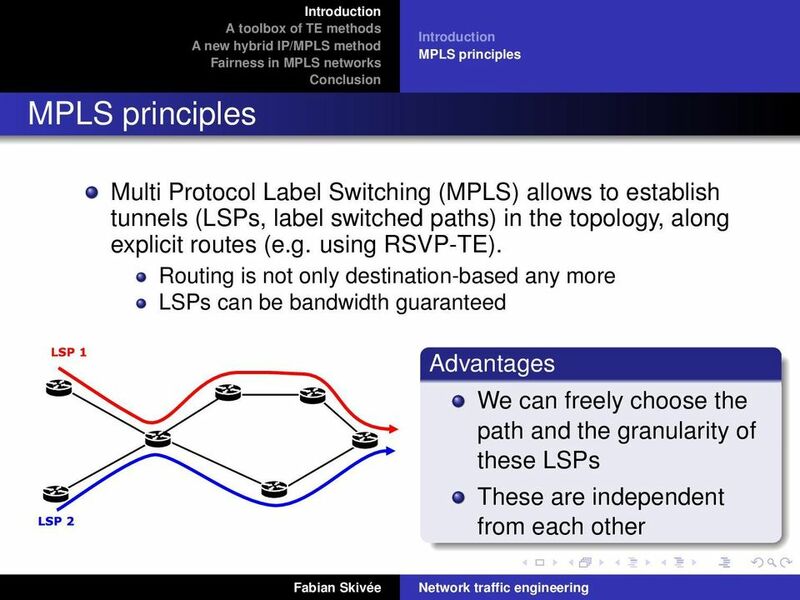 4 MPLS principles Today, most operators overprovision their network. 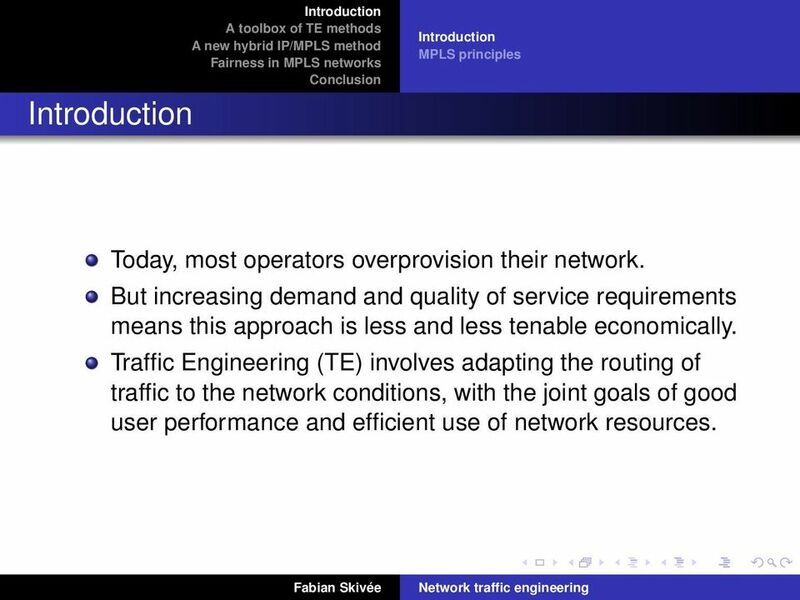 But increasing demand and quality of service requirements means this approach is less and less tenable economically. 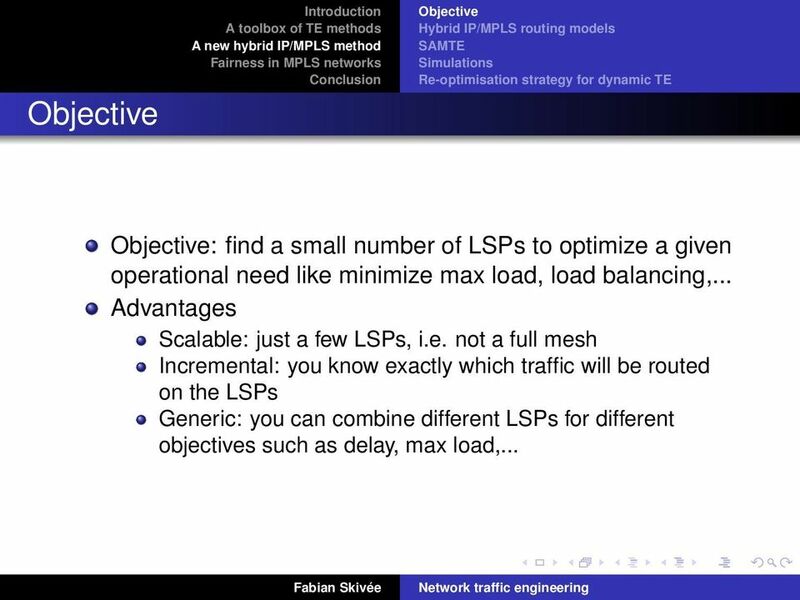 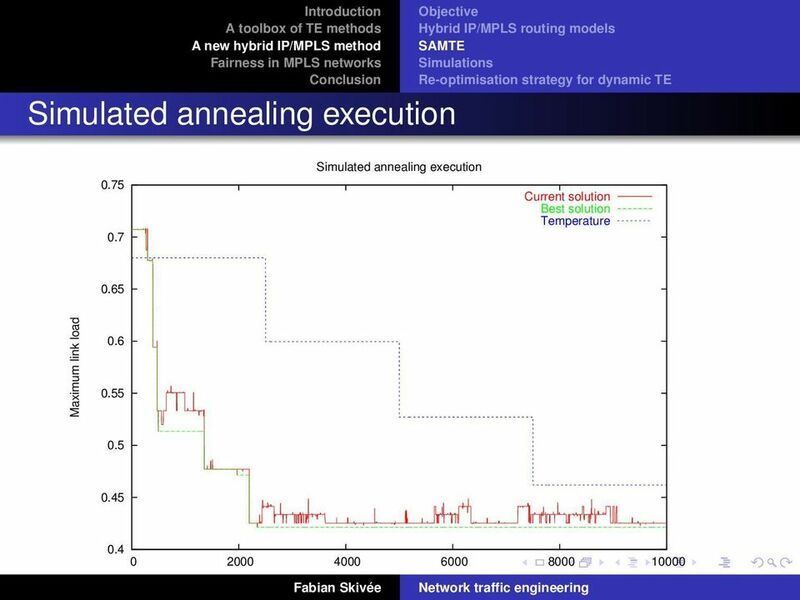 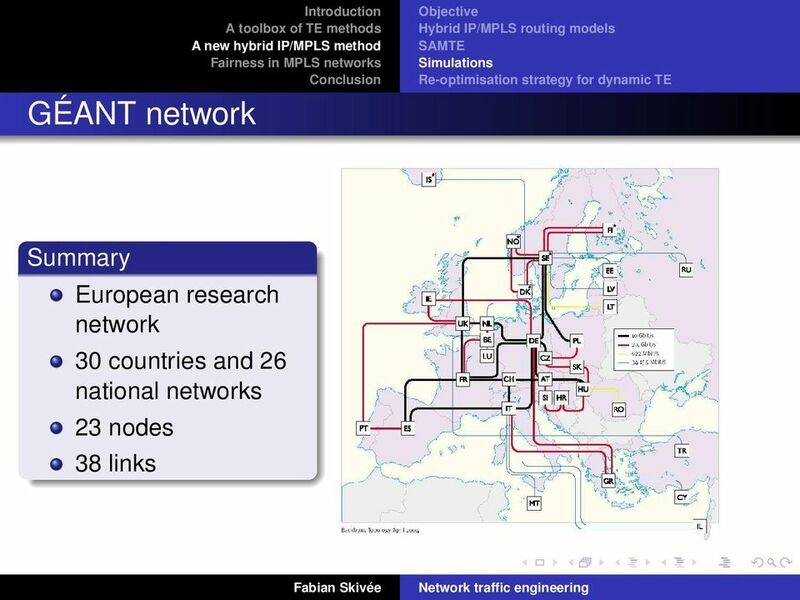 Traffic Engineering (TE) involves adapting the routing of traffic to the network conditions, with the joint goals of good user performance and efficient use of network resources. 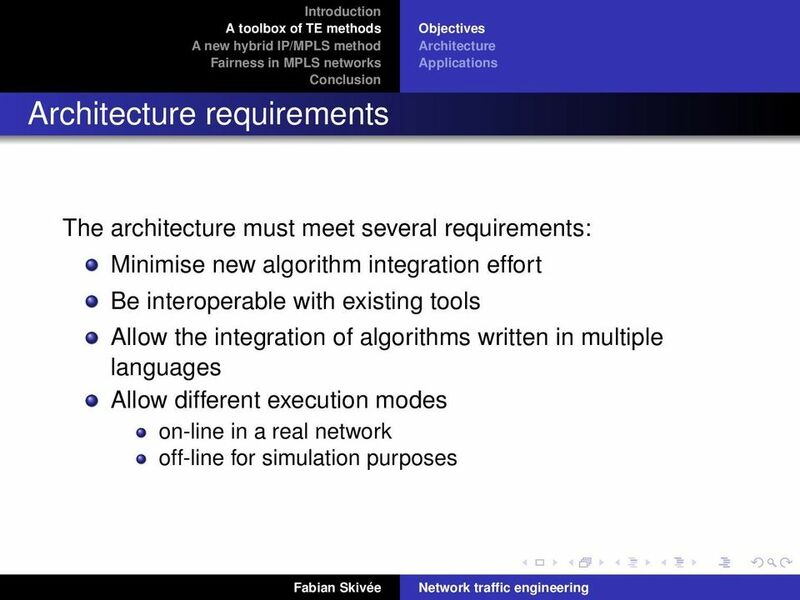 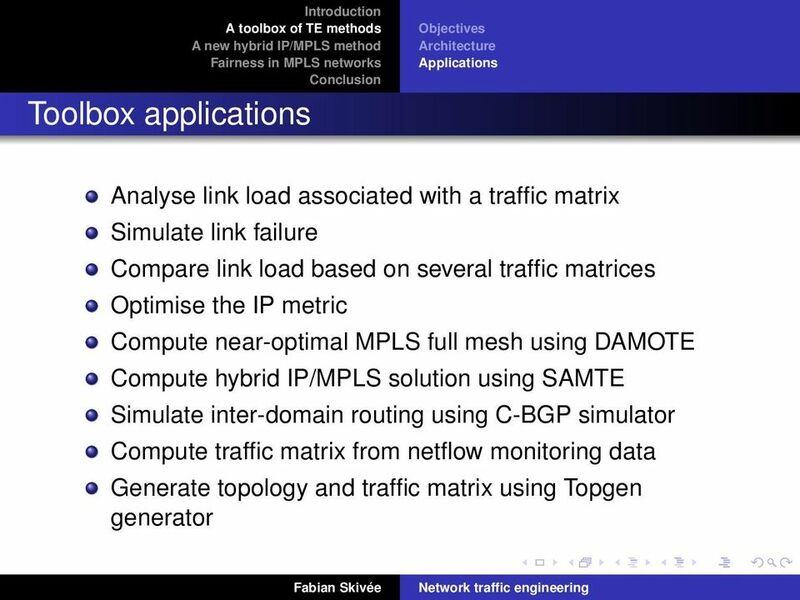 7 Toolbox objectives Objectives Architecture Applications Lots of research in TE domain but not used by operators because of their integration and usage complexity. 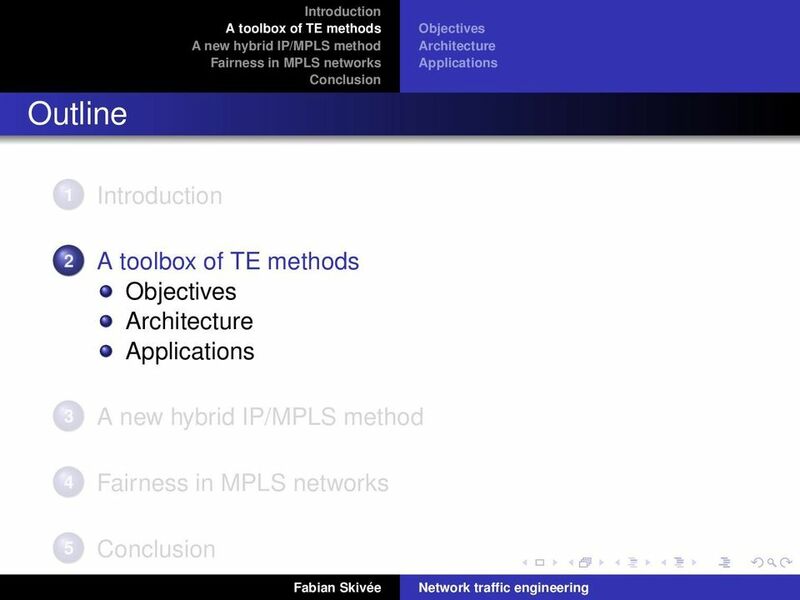 Our TOTEM toolbox has two objectives: Allow researchers to promote their new TE methods and compare them with other existing ones. 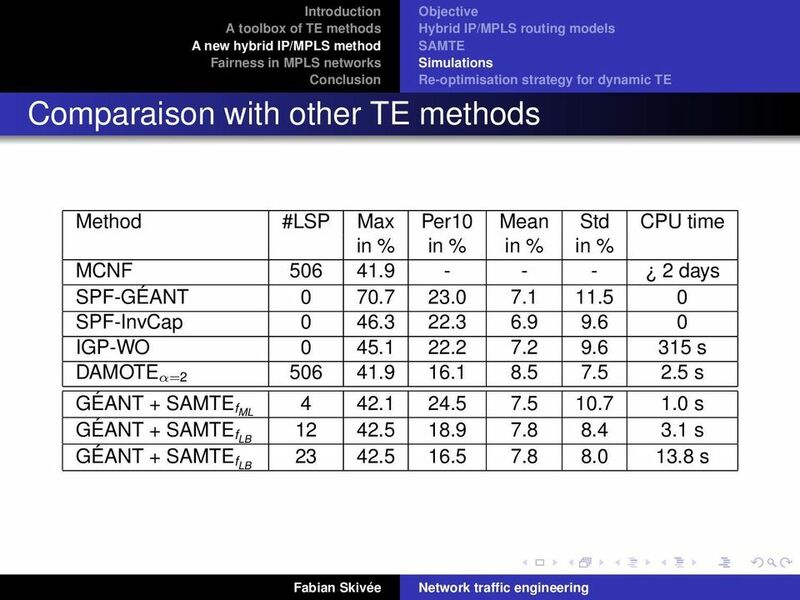 Allow operators to test these methods on their networks. 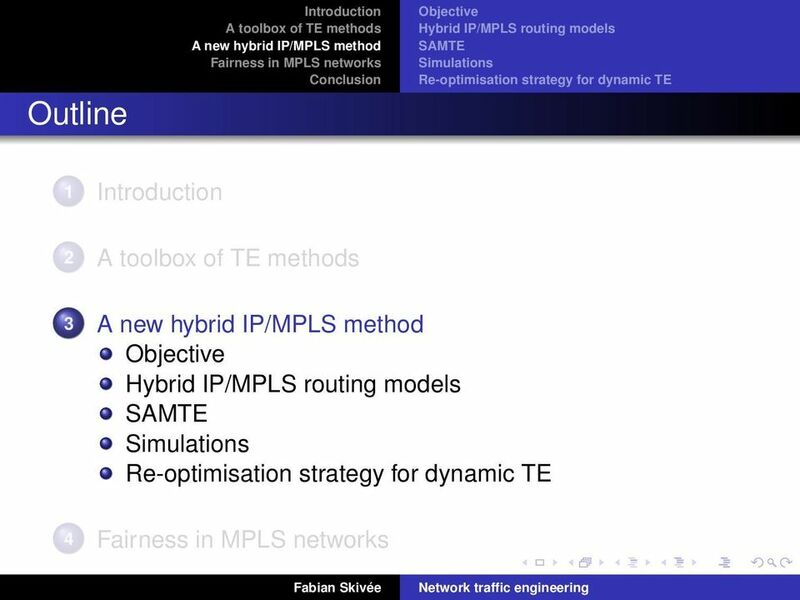 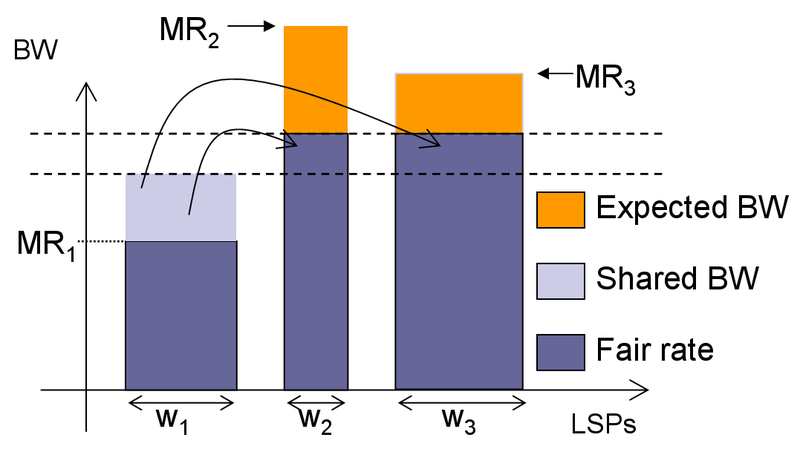 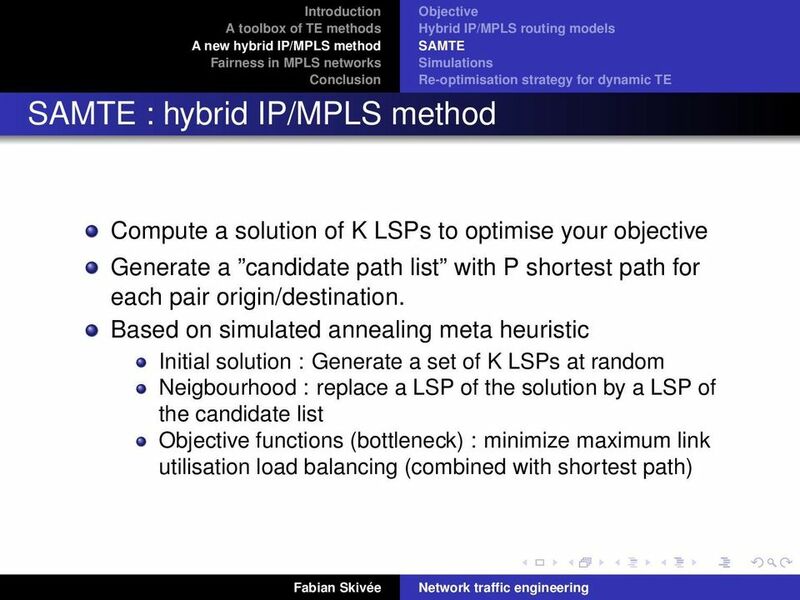 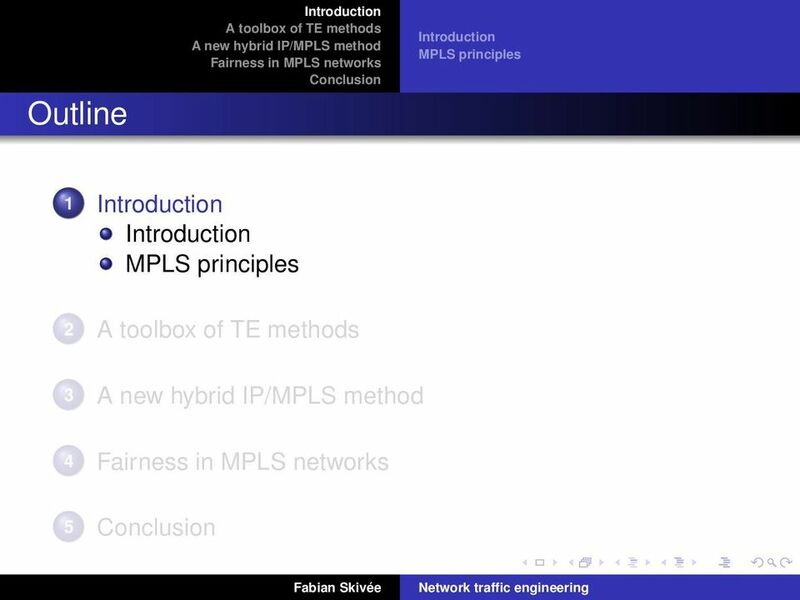 26 Objectives Max-min fairness Distributed algorithm Simulation Proposed distributed WPMM algorithm Periodically, the ingress sends a PATH packet Each router computes a local fair share for the LSP and updates a new RSVP field (called ER, explicit rate) if its local fair rate is less than the actual fair rate Upon receiving a PATH packet, the egress router sends a RESV packet. 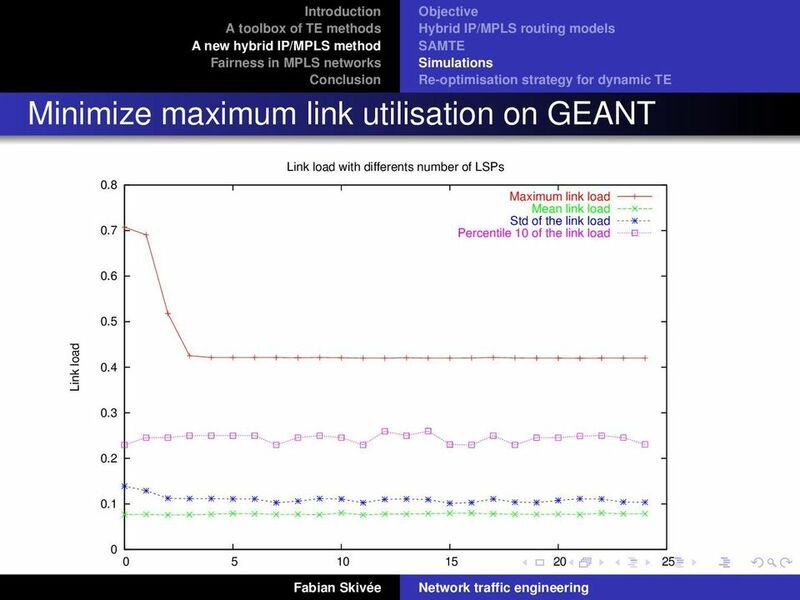 Each router updates its information with the RESV parameters. 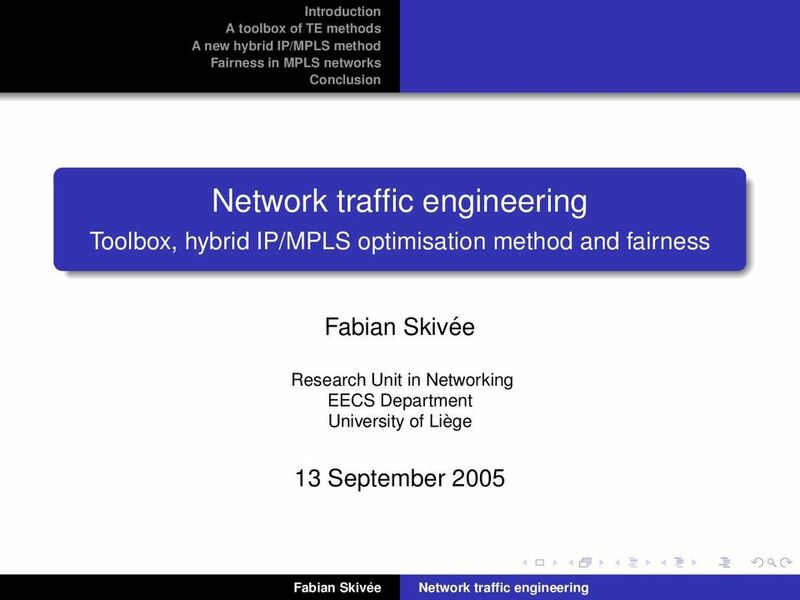 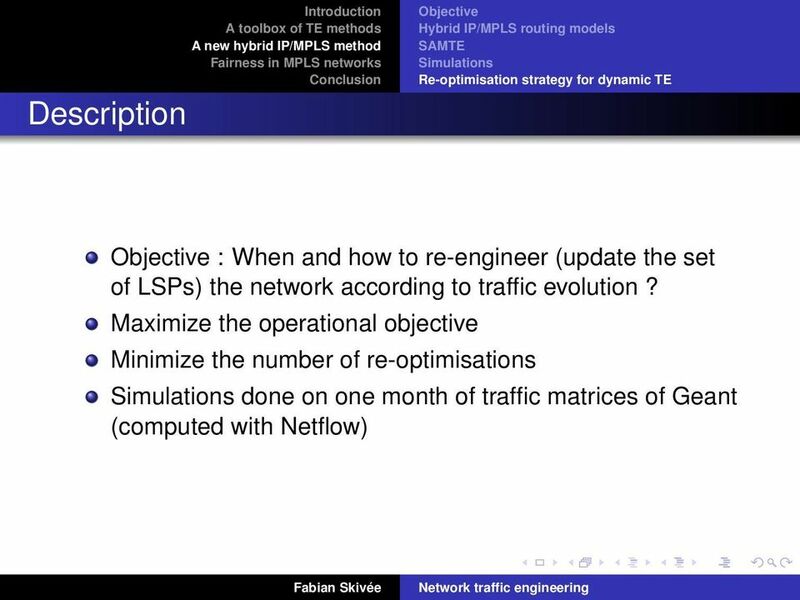 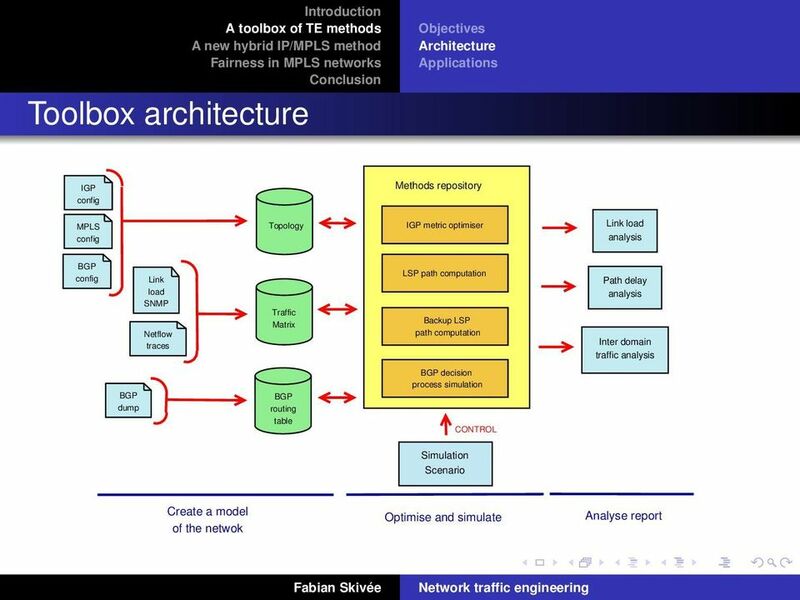 An Open Source Traffic Engineering Toolbox G. Leduc a, H. Abrahamsson e S. Balon a S. Bessler b M. D Arienzo h O. Delcourt a J. Domingo-Pascual d S. C. Erbas g I. Gojmerac b X. Masip d A. Pescapè h B. 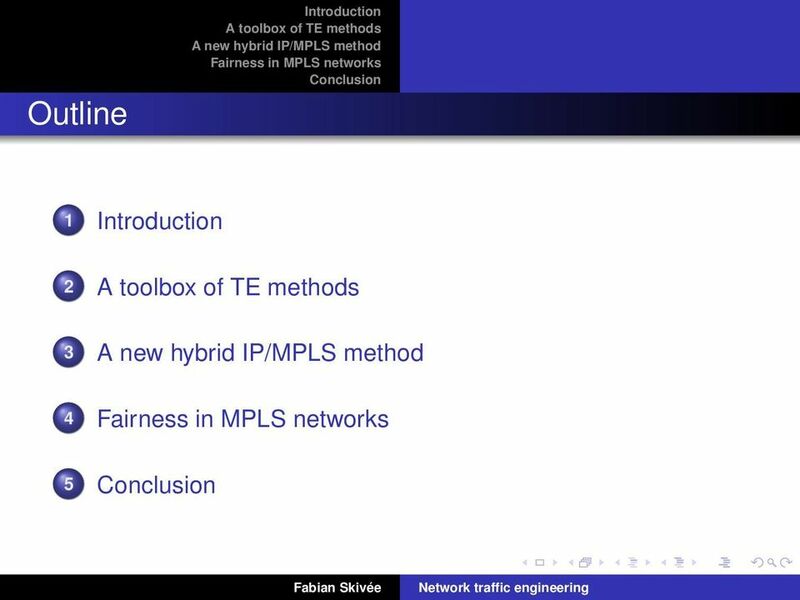 100Gigabit and Beyond: Increasing Capacity in IP/MPLS Networks Today Rahul Vir Product Line Manager Foundry Networks rvir@foundrynet. 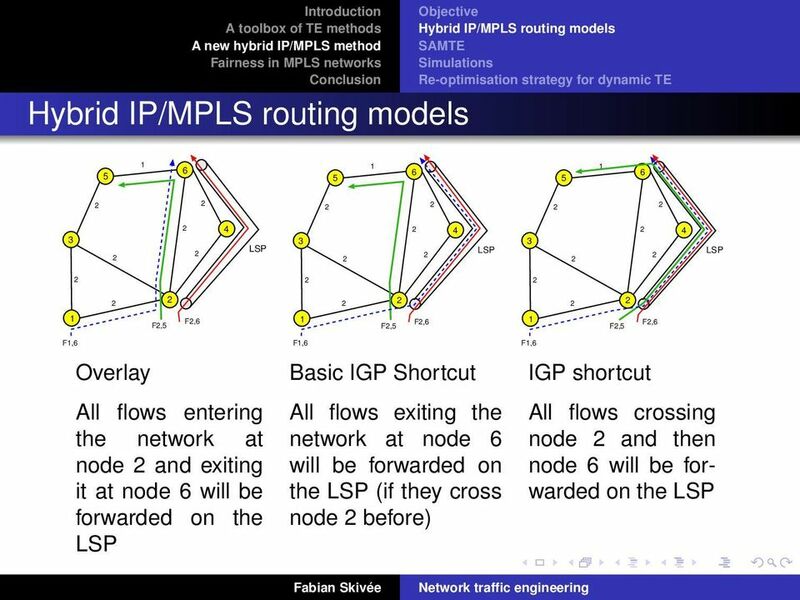 Enhanced Multiple Routing Configurations For Fast IP Network Recovery From Multiple Failures T. Anji Kumar anji5678@gmail.com Dept. 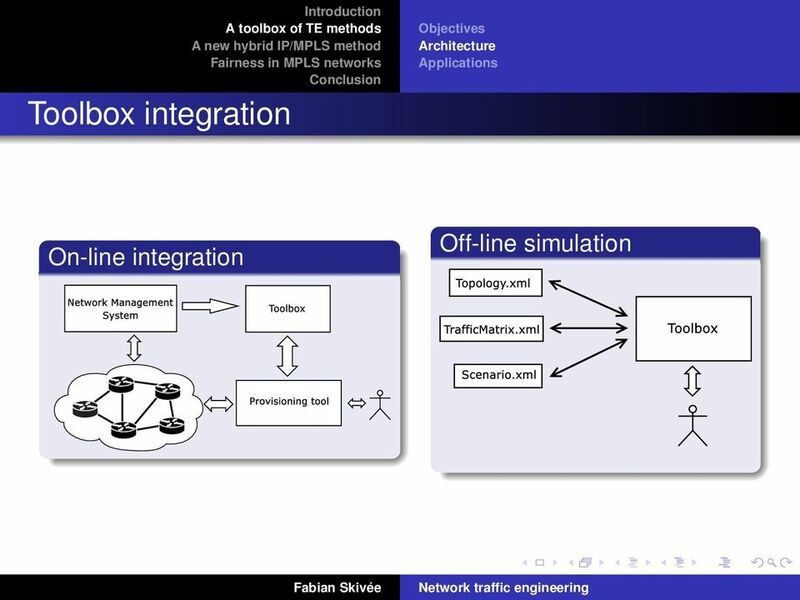 of IT/ UCEV JNTUK Vizianagaram, 535003, India Dr MHM Krishna Prasad Dept.